Unfortunately, Mand may be the exception not the rule. According to the Bureau of Labor Statistics almost 9.2% of Gulf War – era II veterans (any veteran who actively served in the U.S. Armed Forces post September 11, 2001) age 18 and over are unemployed. At the time of this writing that’s almost two full percentage points higher than the national average. For male Gulf War – era II veterans between 18 and 24 that number jumps to 20%. The reasons why young veterans are struggling to find jobs varies. One of the more popular theories suggests employers may not understand what veterans are saying. Last year the Washington Post reported 80% of employers interviewed by the Center for a New American Security (CNAS) say they don’t understand how skills soldiers acquire in the military translate to the business world. In a recent story that appeared in the Silicon Valley Mercury News veteran’s advocates say part of the problem is there isn’t enough help for former military members looking for civilian work. They also say the stigma associated with combat-related mental health issues, like post-traumatic stress disorder (PTSD), may play a role as well. Advocates say the good far outweighs the bad when it comes to hiring military veterans. Military.com offers employers 10 reasons to hire vets. Some of them include accelerated learning curves, efficient performance under pressure and respect for procedures. Mand believes if given the opportunity any one of the 207,000 estimated unemployed veterans would be able to do the same. Please fell free to leave your comments below and if you’d like you can follow me on Twitter @BarclayPollak. I moved back to Madison 5 years ago after my wife retired from 20+ years of active duty service in the US Army. 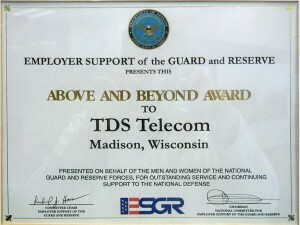 12 years ago, I worked at TDS Telecom while she attended UW Madison for her Masters Degree. When I left TDS (on excellent terms) once she graduated and went back on active duty for her next duty assignment, I was told that I would always be welcome back at TDS. I had worked as a contractor for the US Military for nearly 20 years. I have held top level security clearances, worked for generals and admirals, and have held mid to senior level project management positions. In a military town, I would have no problem finding a job – but Wisconsin is home. After 20 years away from family, we decided that we wanted to come back home for our family and for our kids to be close to the family they grew up not having around them. In Madison, my military experience, background, security clearance, and skills don’t mean a thing and I continue to receive the “thanks, but no thanks” rejection emails when applying for any position in this city. I am either extremely overqualified for some of the entry level positions I am applying for, or under qualified for the senior level positions – similar positions I have held in the past. Or, the HR software that most companies use that does a resume scan doesn’t understand what I have been through the past 20 years. It doesn’t realize that I had to make sacrifices every few years with my career. Establish myself and my family in a new assignment every few years and learn to adapt to new surroundings, new friends, new career opportunities. Then in 3 years, pack up and do it all over again. I tell everyone that the 20+ years I spent as a military spouse was difficult, but at the same time was the best experience of my life. I never would have seen the world and had the opportunities I had if it were not for the military. Now that that part of my life is past and I want to take the next step forward for my career, my military past seems to be getting in the way of my future. If you have a resume come across your desk of a military spouse, or a retired service member, take the time to give it a second look. You may just be missing out on someone that will be dedicated to your cause and more qualified than you could ever imagine. Thank you for sharing your story Brian. I hope you find something in the future.